Welcome to today's edition of the Butterfly Reflections, Ink blog! It's Janette here and it feels like it has been so long since I've said hello to my dear BRI friends! Helloooo! Today I am sharing a card with this amazing stamp set by Concord & 9th, You Are Here. 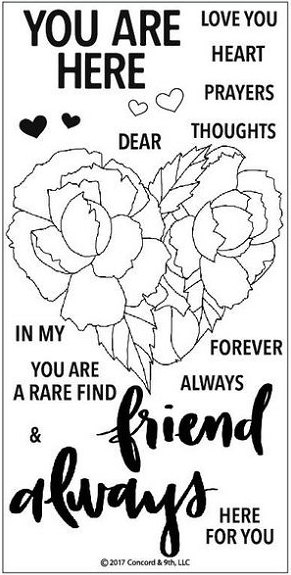 Notice the sentiments and how many variations you can make with them. Really, this set is just wowzers! 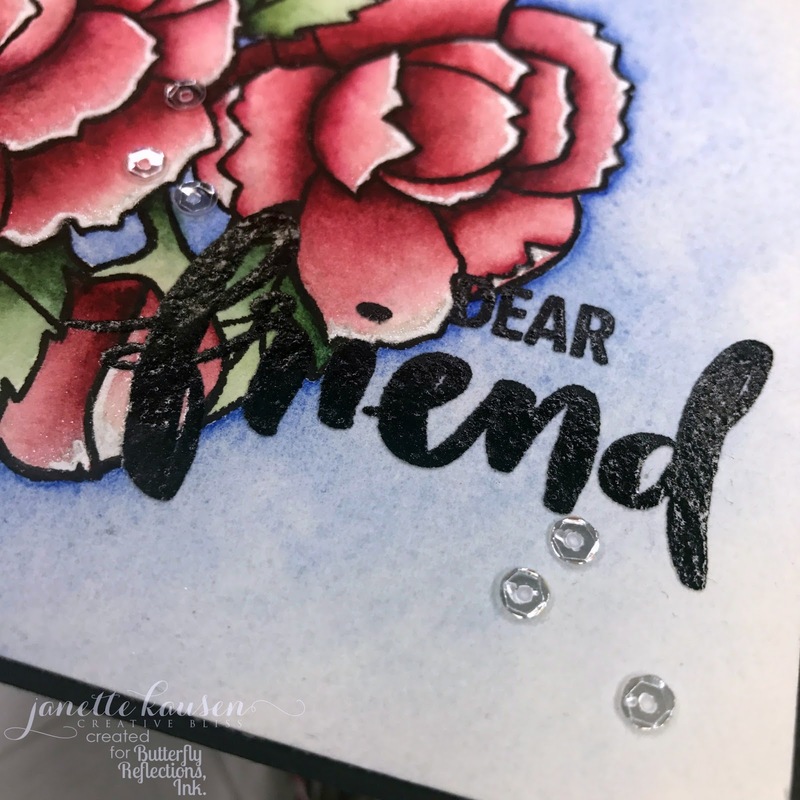 To create this card I began with watercolor paper, a Misti and Copic friendly and waterproof Lawn Fawn Jet Black ink. Using the Misti Precision Stamp tool is invaluable when stamping on textured cardstock like watercolor paper. The Misti allows for the image to be restamped multiple times in the exact same position so that your image will be nice and solid. 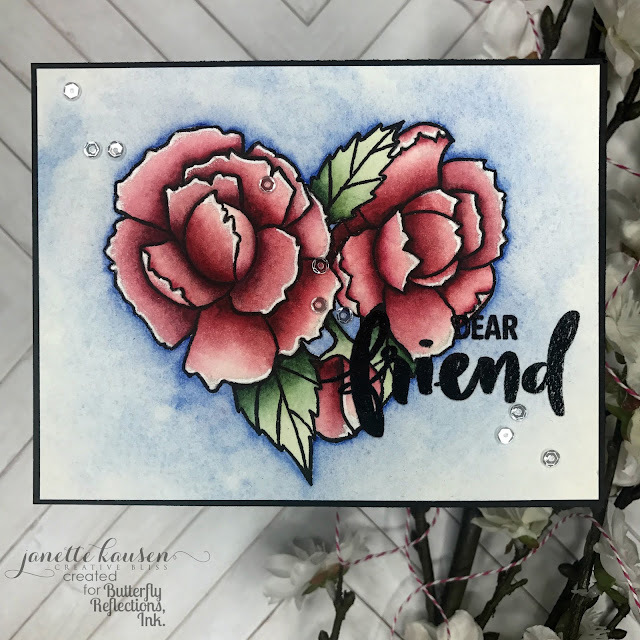 I stamped the flower image 3-4 times for complete coverage and then watercolored with the darkest shading where the petal would connect at the base. 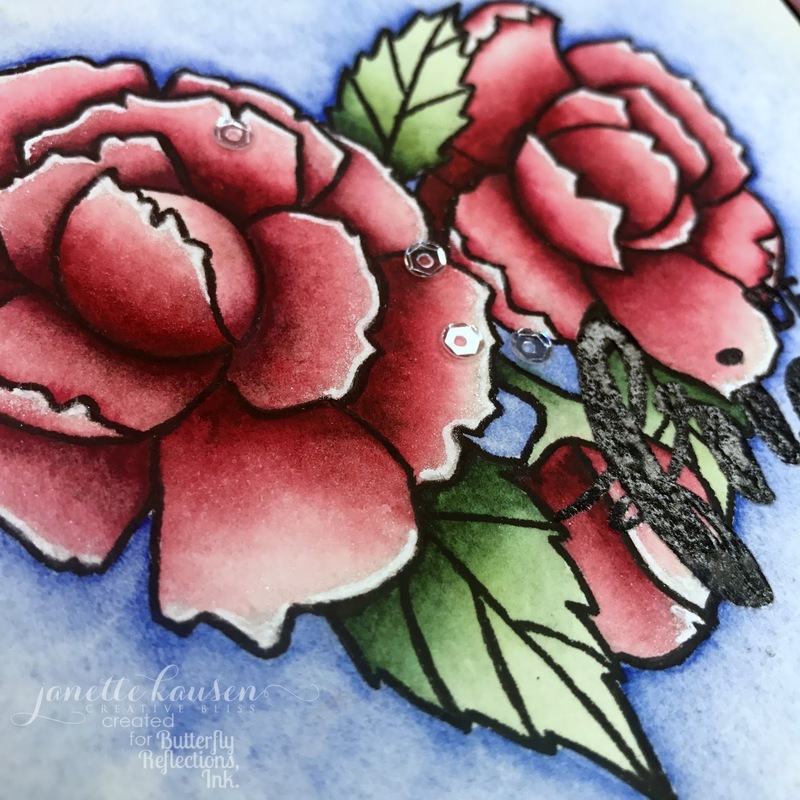 The watercolor portion was completed with a beautiful blue background. Once dry, the sentiment was stamped, again with the Misti, Lawn Fawn Jet Black ink and this time I added Versamark so that the image could be clear heat embossed. I then used a white Uni-Ball Signo pen to highlight the edges of the petals with greater detail. A touch of shimmer was added to the edges of the petals as well with the new Nuvo Aqua Shimmer Glitter Gloss pens. Final glints of sparkle were added with Pretty Pink Posh Sparkling Clear 4mm sequins adhered with Mutli Medium Matte. I hope that this card has inspired you to create. Thank you for stopping by today. Be sure to pop over to BRI to see what the Deal of the Day is. You'll find it in the right hand column if you are on the desktop website, scroll down a touch if you are on a mobile device.